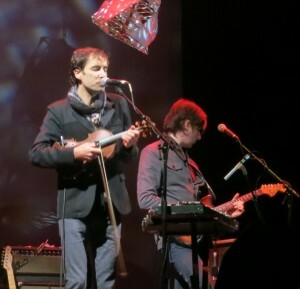 Andrew Bird took the stage on Saturday night to a packed Auditorium Theatre in Chicago, after a rousing set by local punk rock marching band Mucca Pazza. There’s always something special about seeing Bird back in Chicago, on home turf, even if he hasn’t reliably called Chicago proper home in some time now. There’s a different comfort level — this is his place with his people, which can be both anxiety-provoking and exhilarating at the same time. Bird has talked in the past about how he is often more nervous in front of a hometown crowd, but if that’s still true, it wasn’t evident at all as he confidently weaved his way through a nearly two-hour set. I’ve seen Andrew Bird over twenty times in the past few years. I’ve seen him five times in four states since the beginning of the year; it will be six in five come July and Forecastle. Few artists inspire me to that sort of obsessive level of following: state hopping and airports and bus terminals and barely-cobbled-together road trips. He could play the same songs every show and I’d still probably go; there’s something about his music that I’ve still not really been able to put my finger on, all these years later, that keeps drawing me back in. I say all of this not to let my Superfan Flag fly (it does that anyway) but to say that in all the times that I’ve seen him, I’ve never seen him quite so relaxed and at ease with the audience as he was at this show. Perhaps, for once, he wasn’t ill. Perhaps it’s the nice weather. Perhaps it’s just that life is finally going Bird’s way, after years and years of grueling hard work. Perhaps it’s because the tour’s over — Chicago was the last stop on this leg. Whatever it is, it’s working for him, because this show was nearly flawless. (I wondered, back in March, what it would be like to see a show where he was at or near 100% — this might have been it.) 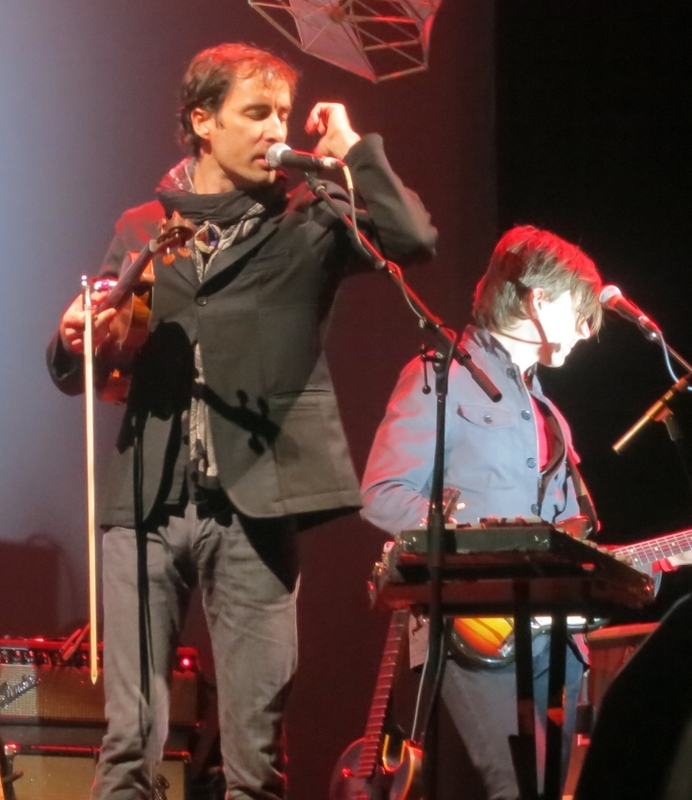 He was in top form, with strong voice and clear whistle, and it sounded to me like he was doing some new, interesting things with harmonies (both vocally and on violin) throughout the show. The bulk of the set was given over to songs from his new release, Break It Yourself. The album, with only a few exceptions, fits into a comfortable, low key groove. It was a perfect vibe for the 3900+ capacity seated show: a rock show, but often in the most gentle of ways. (Sometimes, I miss jumping up and down and shouting, huge outdoor festival style, along with “Tables and Chairs” — we were so tired of being mild, like a battle cry, a reminder, a pledge — but, let’s face it, I would have just complained about my knees hurting, anyway.) There were moments where the energy edged higher than comfortable: a slightly quicker-than-usual “Orpheo Looks Back” (and the layered, looped vocals at the end still give me chills), leading single “Eyeoneye”, a combination of live rarity “Dear Dirty” and Alpha Consumer cover “The Crown Salesman”. That song-merge came with the always delightful explanation of “Dear Dirty”‘s origins: a discarded letter found in the street, the lyrics taken near verbatim from it. Bird’s deadpan recitation of the letter makes the story worth it, no matter how many times I hear it. The actual, physical performance of the new songs still seems to be settling in with Bird. It’s not that they’re lacking confidence, but they’re missing the … ease of theatricality? that comes so easily to older songs. I never got to see songs like “Tables and Chairs” and “Fake Palindromes” when they were new to the set, but I imagine that once upon a time, they were a bit stiff, less fluid than they are now. Those songs are performances, full-body music, magic. The newest songs aren’t there yet, but they will be, and I can’t wait to see it.